Anne Margaret Nichol when a young lady liked to help her father, Dr. Thomas Nichol, on difficult cases and accompanied him as a nurse. After taking teacher's examinations, she was assigned a school at Barrett, Marshall County, Kansas. When she arrived she found a two-room school house. Mr. Frost was teacher of the upper four grades and Maggie Nichol was assigned the first four. And so it was that these two young people working together to teach these Kansas school children, fell in love. When the five months term was ended, Simpson Paine Frost and Ann Margaret Nichol were married March 24th, 1870. They decided to take a trip to Oskaloosa, Iowa so that the new groom could meet his bride's parents. The trip was made by horse and buggy and they arrived late one Saturday night, very tired, travel worn and dirty. Next morning Simpson started to shine his boots and get ready for church. Dr.Nichol came into the kitchen and found Simpson blacking his boots. He immediately told him they "didn't do a thing like that on Sunday". The Nichol family were very strict United Presbyterians and didn't believe in doing anything on Sunday if it could be done on other days. Young Frost said, "If I can't black my boots, I won't go to church", and so it was that son-in-law and father-in-law were at swords point from the day they met, never agreeing on anything the rest of their lives. Simpson Frost (Photo of SIMPSON about 1905) and his wife went back to Barrett, Kansas on a Homestead. By next January they had a daughter whom they name Maud Lillian. That summer they worked hard and crops were good. They now had a team. a buggy and a cow. One morning the sky darkened, and going outside they saw swarms of grasshoppers devouring everything - not even a blade of grass was left. There was nothing to do but leave the county, so they went back to Iowa, near Centerville. Here on March 16, 1972 Robert Thomas was born. The next spring they returned to the Kansas Homestead and planted more crops. Here in Marshall County Sara Almeda was born on May 20, 1873, and Edith Louetta on September 22, 1874. They moved again to Iowa where Metta May was born December 23, 1875, and Clyde Simpson March 30, 1878 at Seymour, Iowa. By this time, Simpson had become very handy with carpenter tools. An older brother in Montana wrote of excellent openings for a millwright; Simpson was off to Wicks, Montana where he helped build the mill for the big copper company. Soon he was able to send for his family and Maggie Frost and her six young children traveled by train from Iowa to Utah railhead and on by dray wagon to Wicks to join her husband. The wild Montana country made a great impression on all, especially the oldest child, Maud, who must often help mother the smaller ones. On their joyous explorations of hill and valley they were ever alert for moving cattle as the wild "Texas Long Horns", could be dangerous. Once they were forced to flatten themselves behind rather small rocks while a great herd being driven passed over them. Luckily no one was hurt, but the frightening experience was never forgotten. In Wicks, Montana the last three of their nine children were born; John Roy, May 7, 1882, Landon Ray Clark, February 19, 1884 and Jennette Blanch, July 25, 1887. One night the mill burned, the Company decided not to re- build, so the Frost family returned to Iowa. They lived near Oskaloosa, later purchasing a ten acre tract northeast of town. Simpson traveled about to work better jobs as expert carpenter, often around Centerville. About 1905, he went o Omaha where he worked for the Omaha Wagon Works. He died in a boarding-house fire, March 24, 1908. His widow lived in Oskaloosa until her death on January 16, 1917. The article in the Omaha World Herald, March 25, 1908, p. 1 reported that "'Grandpa Frost', a laborer in the Omaha Wagon Works was burned to death Tuesday night in a fire which completely destroyed a lodging house at twenty-first and J Avenue, East Omaha. It is thought that Frost had gone up to his room to get his clothes, and was caught by falling walls or timbers. At first it was believed that all had escaped but before the fire was extinguished it was discovered that he was absent. 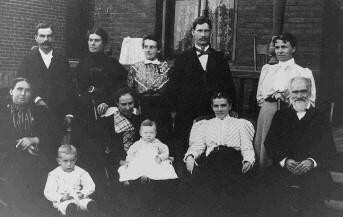 ......"
Standing: Robert, Maud (Frost), Tallie, Richard, Mamie (Garlick) Parsons.